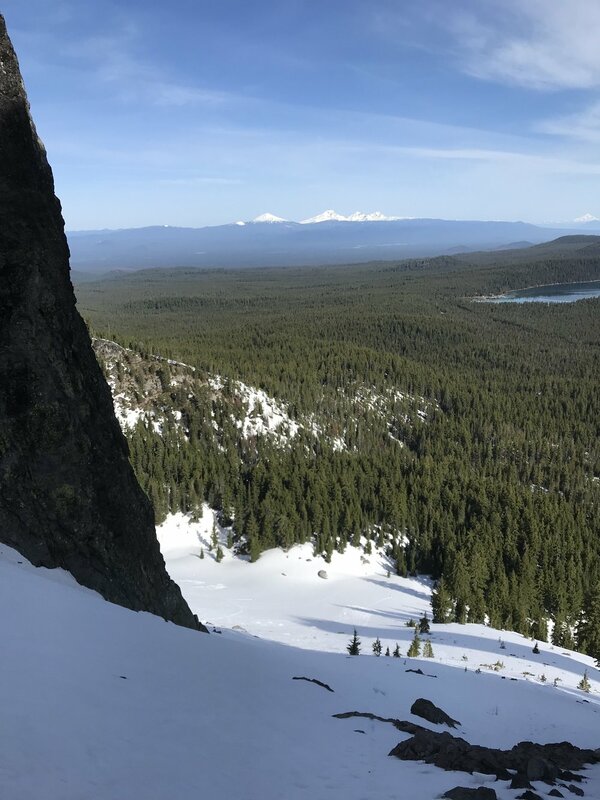 Looking to put some of the skills from the Idaho trip to use, on May 3rd 2018, I headed up to the Newberry Caldera National Monument in search of north-facing chutes on Paulina Peak. Having first spied these lines 2 years prior, but lacking the requisite backcountry ski and travel techniques to approach and navigate the terrain, they remained on my tick list come 2018. The remnants of a massive volcano and lava flow, the entire Newberry is worth a visit in all seasons for every recreationalist. Hiking, mountain biking, fishing, boating, SUPing, running, nordic skiing, and even ice climbing draw adventurers to this area. The caldera rings two lakes, Paulina and East, with Paulina Lake featuring rustic hot springs on its northeast shore. All in all this is a beautiful area I try to visit many times each year. Today’s goal was to use my bicycle to access the monument, stash the bike in the woods, hike up Paulina Peak, and ski one of the steep chutes back toward the twin lakes below. A bicycle was necessary because the road up to the lakes closes each year from November to mid-May depending on snow conditions. Today was ideal, as the gate was closed at 10-Mile Sno Park but the road was completely dry, making for an easy, albeit all uphill, 4-mile ride to a spot that looked good to start hiking toward the chutes. I was worried the patchy snow leading from the paved road to the toe of the chutes would be unsupportable and lead to post-holing the entire approach but luckily it was cold enough the night before to provided a strong freeze. Although there wasn’t enough snow to make skinning worthwhile, the hiking went by quickly, and I was soon staring up toward Paulina Peak, consistent snowy lines showing the way up. What followed was about 45 minutes of kicking steps in the snow, soft enough not to warrant an axe or crampons. While I felt fit from the recent barrage of skiing in Idaho, the slope angle was unrelenting and I took frequent short breaks to preserve my energy for the descent. Once on top of Paulina Peak I quickly transitioned to ski mode and prepared to descend my line of ascent. I had noted the snow was quite consolidated and was not concerned about avalanche activity on this particular slope. Entering the NW chute I found chittery, solid snow with minimal sloughing from turn to turn. While not quite requiring jump-turns, the angle was steep enough to hold my attention and before I knew it I was back down inside the cirque I had started my uphill boot pack from. A lot of effort for 60 seconds of skiing, but isn’t that what backcountry skiing is all about? Skis back on my pack I walked north until I hit the paved road, turned left, and found my stashed bicycle without too much trouble. The ride to 10-mile Sno Park was a breeze and I was back to Karen (my car) after 11 miles of effort over 3 hours. Total elevation gain from car to summit was about 2,200 feet. This was a great introduction to skiing the Paulina Peak chutes and will definitely go back here next season and attempt multiple laps in the chutes. Mid-winter this would require a pretty long skin on the paved road and avalanches are a real hazard here. Please check the avalanche report at coavalance.org and be sure you have proper training and equipment if going after this route in winter or anytime the snow has not had ample opportunity to consolidate.